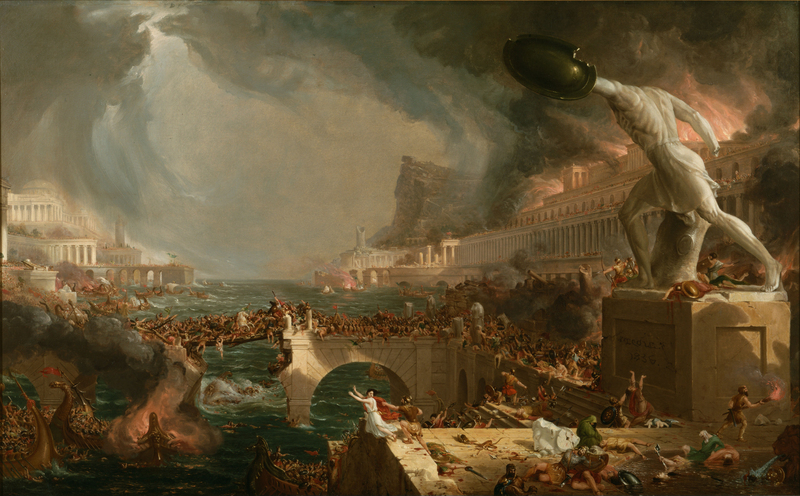 Thomas Cole’s 1836 painting, The Destruction of Empire, from his series The Course of Empire. – The fun never stops in British higher education. Turns out one of the graduate TAs here did some jail time in Egypt for – and is still a member of – Hizb-ut Tahrir. Fantastic work, LSE. – Taibbi is full of fightin’ words. It’s nice to read a diatribe like this and not be turned off – he’s exactly right about pretty much anything. This is rapidly becoming a central question to our time: is capitalism sustainable? – I’d like to see this applied on a large, large scale. – It would be pretty fun to stumble upon an Afghan village in the middle of Indiana. What do the Indianans think? Full immersion is the way to go. – Joseph Fouche at Chicago Boyz on Jonathan Rauch and the ossification of the American way.